Let Trick or Treaters with Allergies Know You've Got Something Special for Them with a Teal Pumpkin on Your Doorstep! Photo by: The Teal Pumpkin Project. Over the past few years, you might have begun noticing teal pumpkins on doorsteps throughout your neighborhood, a strange sight if you're unfamiliar with the trend, but a beacon of Halloween hope for little ones with extreme food allergies who want to participate in the Halloween Fun still. Known as "The Teal Pumpkin Project", home owners across the country have begun putting out a teal pumpkin on their doorstep if they're offering allergen-free treats, including nut-free candies, small toys, and other allergy-conscious treats for little ghosts and ghouls on Halloween. According to Food Allergy Research & Education (also known as FARE), the organizers of the Teal Pumpkin Project, idea behind the Teal Pumpkin Project, the idea is to make Trick or Treating an inclusive experience for all children, even those with food allergies. They offer a wide variety of resources for not only parents of children suffering from severe allergies, but for those of us who will be handing out sweet treats this Halloween, including festive printable flyers emblazoned with the Teal Pumpkin Project Logo that indicate whether you've got candy, non-food treats, or both to hand out on Halloween, letting those with allergies know you're a house to visit this Halloween, even if you don't have a teal pumpkin of your own yet. In addition to offering resources for home owners handing out candy, FARE has an interactive map of Teal Pumpkin participants right on their website, so that parents can plan their child's trick or treating trip ahead of time, and find a neighborhood that's friendly to those who suffer from allergies. Households who would like to participate can also easily add themselves to the ever-expanding map, so that kids suffering from allergies can find their homes more easily this Halloween. According to a press release issued by Food Allergy Research & Education earlier this month, 1 in every 13 US children suffers from at least one food allergy, making it difficult for those children to participate in trick or treating. Lois A. Witkop, Chief Advancement Officer for FARE stated "One in 13 children in the U.S. has at least one food allergy, and reports show that anaphylactic food reactions have climbed dramatically in recent years..It’s clear that food allergies are a serious public health issue that we all must take seriously. The Teal Pumpkin Project provides an opportunity for all of us to show empathy for kids who often feel excluded. We would love to see at least one teal pumpkin on every block – and it’s a terrific way for communities to come together to celebration inclusion." To find out more about The Teal Pumpkin Project, and for tips and tools for participating this Halloween, visit the Teal Pumpkin Project's website. 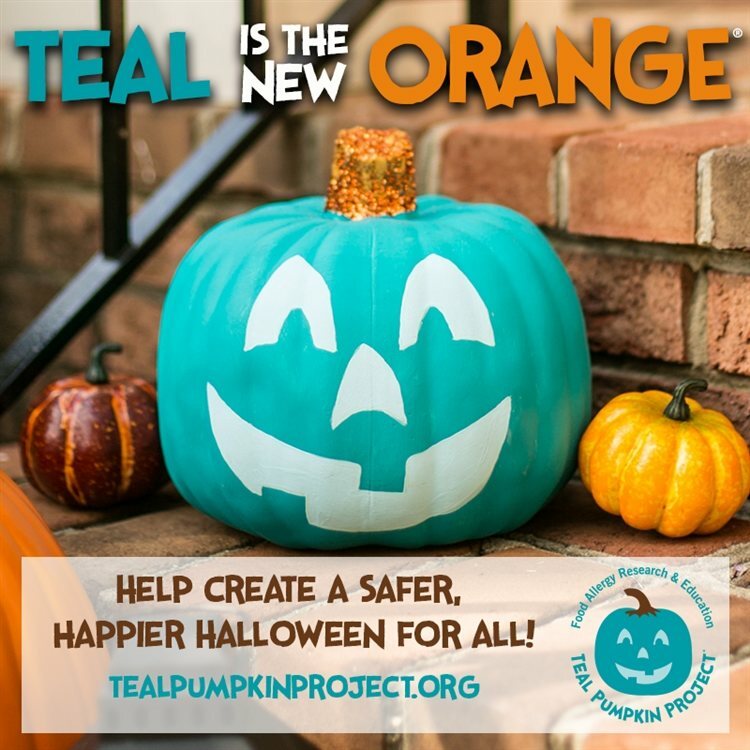 Will You Be Participating in The Teal Pumpkin Project This Halloween? What Will You Be Handing Out to Trick or Treaters in Lieu of Candy?